During our last visit to GCM, Ramen Hood closed earlier than expected, so we opted to give the new Golden Road beer counter a shot since we were still hungry. 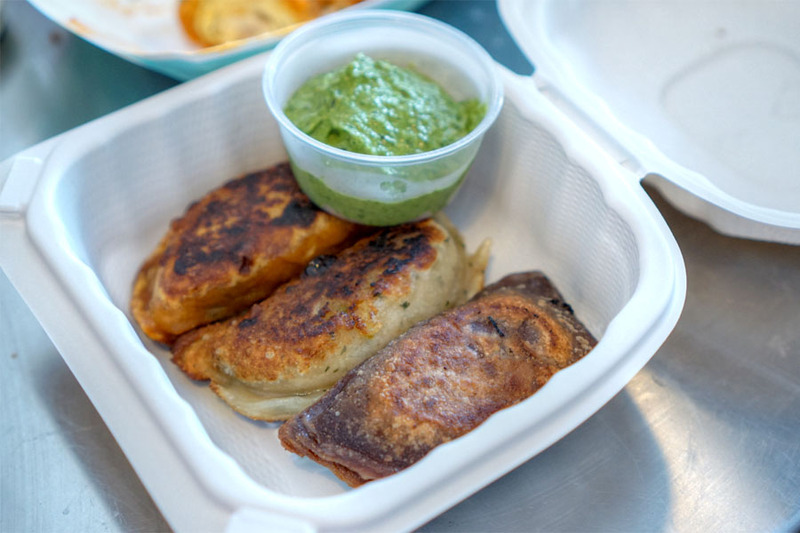 The stall opened on March 8th as the latest outpost of the Atwater Village-based brewery, which was founded in 2011 by Meg Gill and Tony Yanow (of Mohawk Bend and Tony's Darts Away fame). Golden Road eventually became the largest craft brewery in LA county, and was purchased last September by Anheuser-Busch InBev in a somewhat controversial deal. 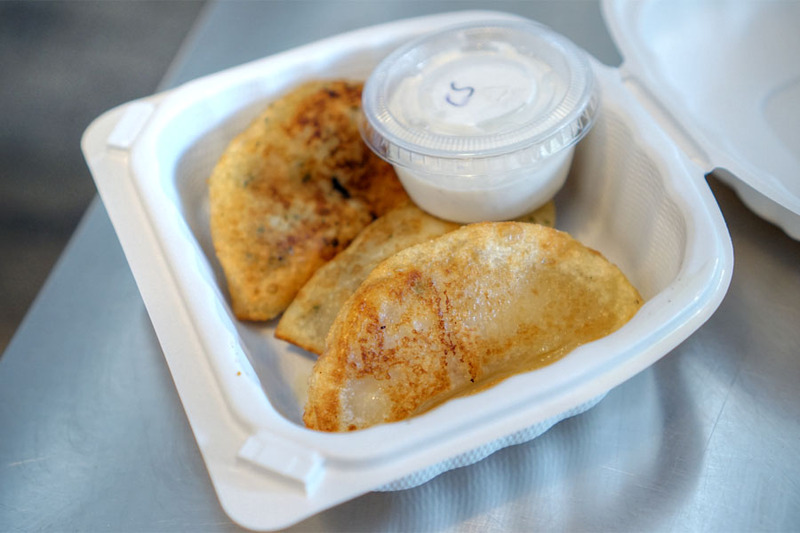 As for the food menu, you get five pierogi options joined by a selection of salads and small plates. Drink-wise, you'll find a pretty complete selection of Golden Road beers on tap. Click for larger versions. 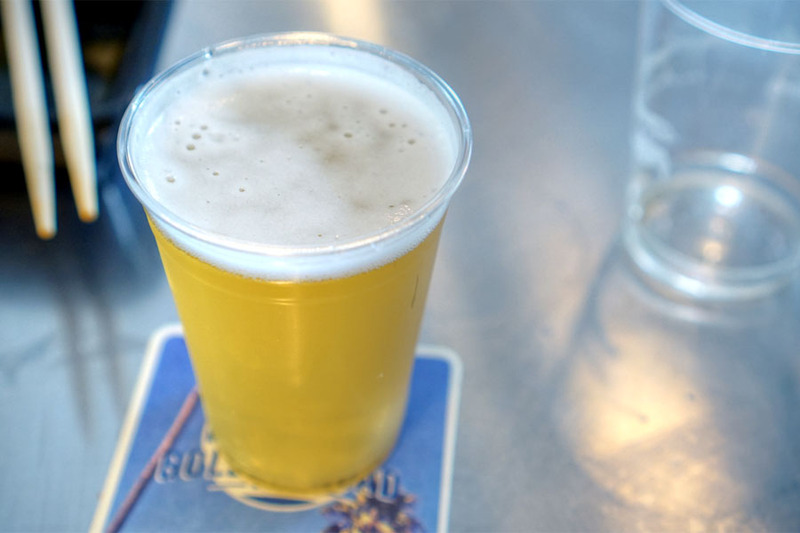 Speaking of beers on draft, we tried the Saison Citron, Golden Road's take on the popular farmhouse style, brewed with Meyer lemon and hopped with Cascade and El Dorado. Nose was of tart grain and slight citrus. Palate was light, bringing more tartness commingled with subtle funk, fruitiness, and spice, the finish veering bitter. 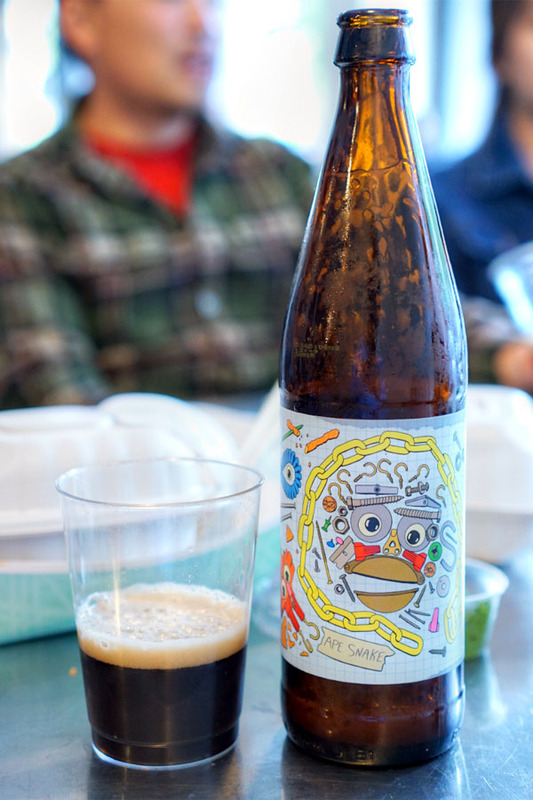 We didn't sample any other Golden Road beers given that we still had a number of bottles left to drink from Ramen Hood. 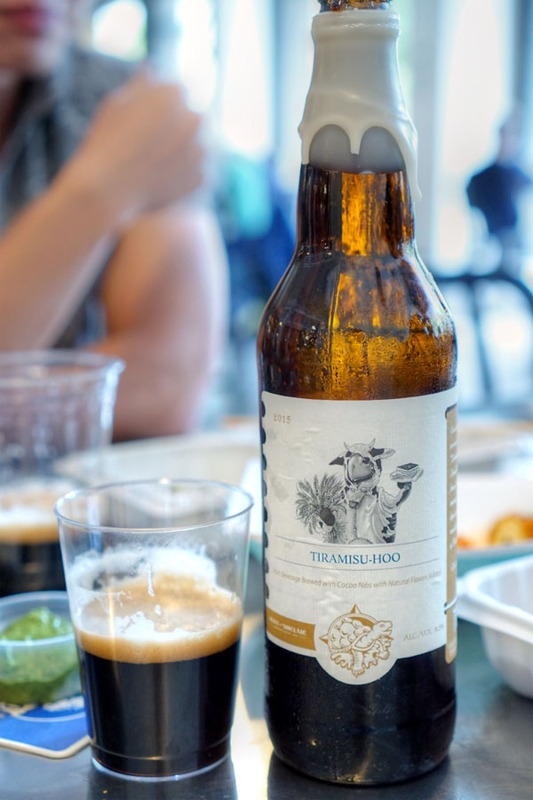 The 2015 Terrapin Tiramisu-Hoo was an imperial milk stout brewed with lactose, Olive & Sinclair cocoa nibs, coffee, and vanilla. Aroma-wise, I got lots of cocoa powder and dark fruit, along with a marked bitterness, while the taste displayed more dark fruit and malt, slight coffee, and an interesting smokiness on the finish. It didn't taste all that much like tiramisu, actually. Onion and Leek - caramelized onion, leek, green onions, sauerkraut, potato: Nice creaminess, with leek bitterness balanced by the sweetness of onion. My overall favorite. Bacon Cheddar - bacon, onion, aged cheddar, potato, w/ cumin sour cream: I couldn't really taste much bacon or cheddar at all. Wild Mushroom - onions, spinach, potato, w/ pesto sauce: Weirdly astringent (think cleaning agent) and one of the most off-putting things I've put in my mouth in recent times. 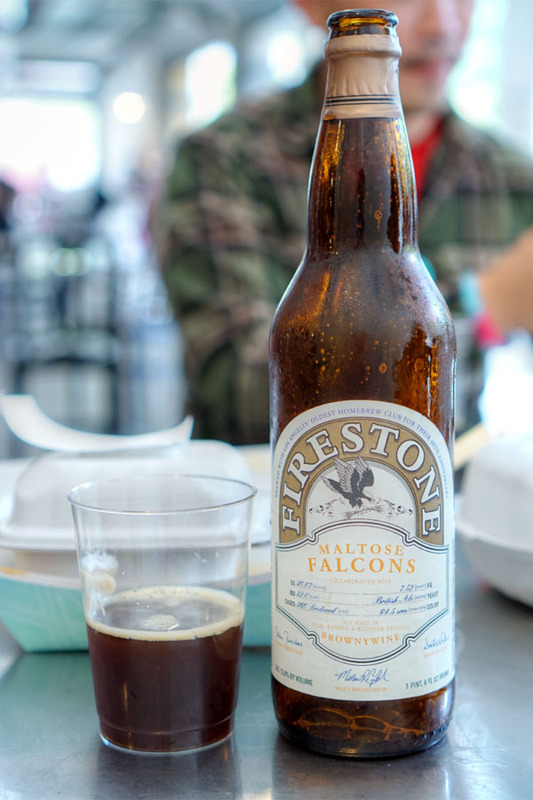 Next to drink was the 2014 Firestone Walker Maltose Falcons Brownywine, a brown ale brewed with brown sugar, then aged for seven months in a combination of rum, brandy, and bourbon barrels that was created in collaboration with the Maltose Falcons homebrew club. It was the clear standout of the meal: smelled of deliciously sugary toffee and malt, and tasted of more rich malt and cocoa, tinged with a delectable rum-fueled spiciness. 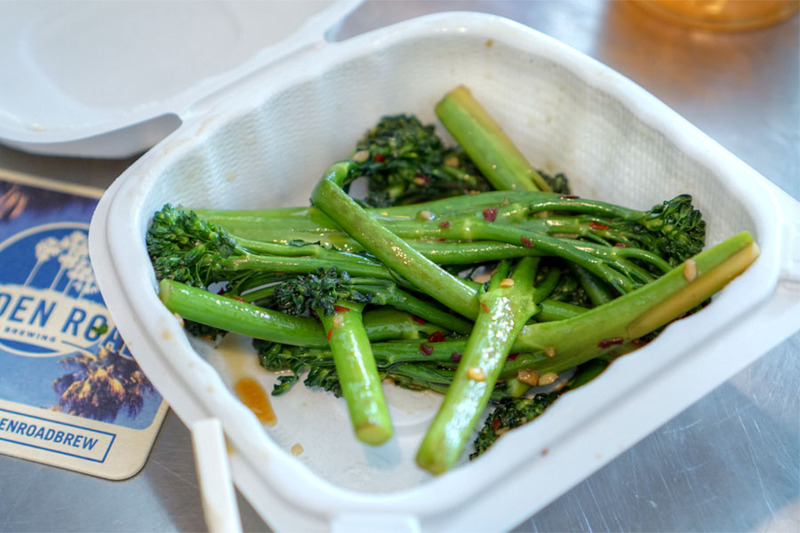 The broccolini was spot on, coming out delightfully crunchy, with its marriage of bitter and savory flavors well-accented by a touch of heat on the finish. The 2016 Prairie Ape Snake was a dark farmhouse ale dry-hopped with Centennial and Falconer's Flight. In terms of bouquet, I got a pleasant balance of hoppy and funky. Meanwhile, the taste was much more aggressive, but not particularly hop-forward, with strong barnyard and Band-Aid notes leading to spice and malt on the back end. Banh Mi - Roasted pork, pickled veggies (carrots, onions, daikon), cilantro and basil: Sweet and spicy, but not all that much like bánh mì. 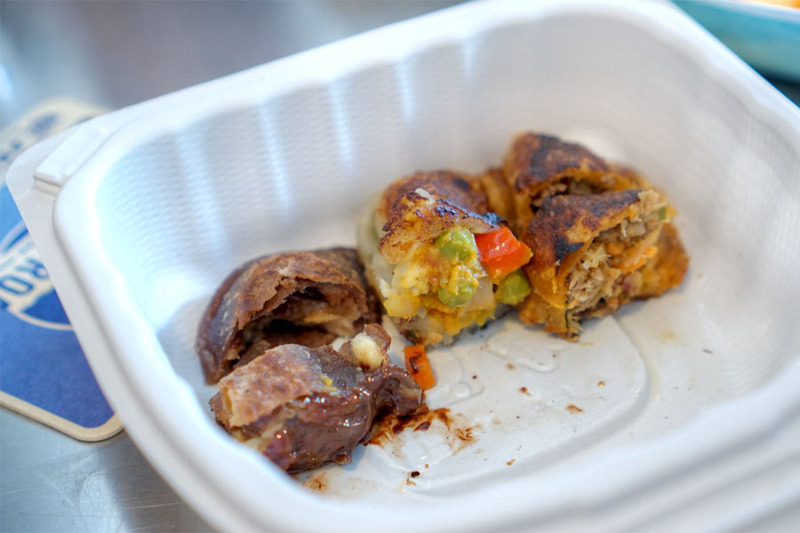 One of my dining companions remarked that it had an "Asian pastry" taste to it. Curried Vegetable - Peas, carrots, curried kobucha puree, peas and carrots: Not bad, with a South Asian-y spice to it. Peanut Butter-Banana: The chocolate was heavy-handed, overpowering, and I had a hard time detecting much peanut butter or banana. 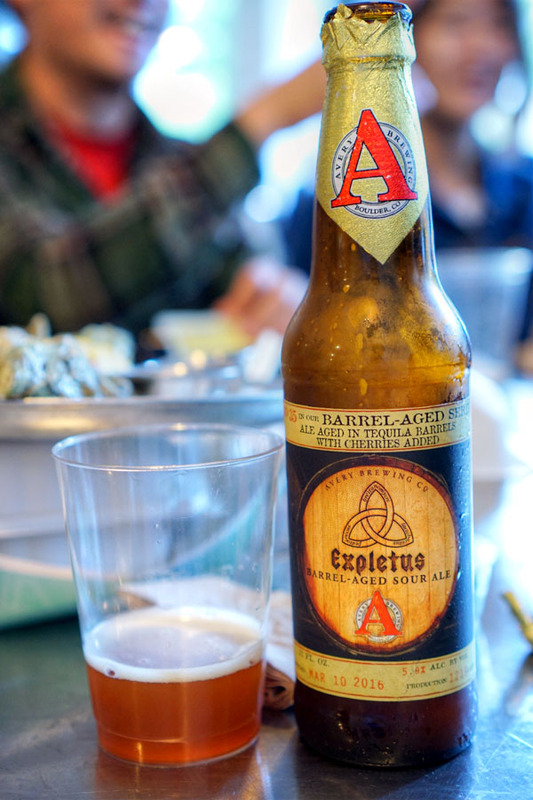 Here was a sour ale aged in tequila barrels with cherries, the 2016 Avery Expletus. Aromas were decidedly tart, with a bit of sweetness from the fruit. Taste went even more sour, acidic, with wood and leather nuances in the midst of some vinegar-y flavors. 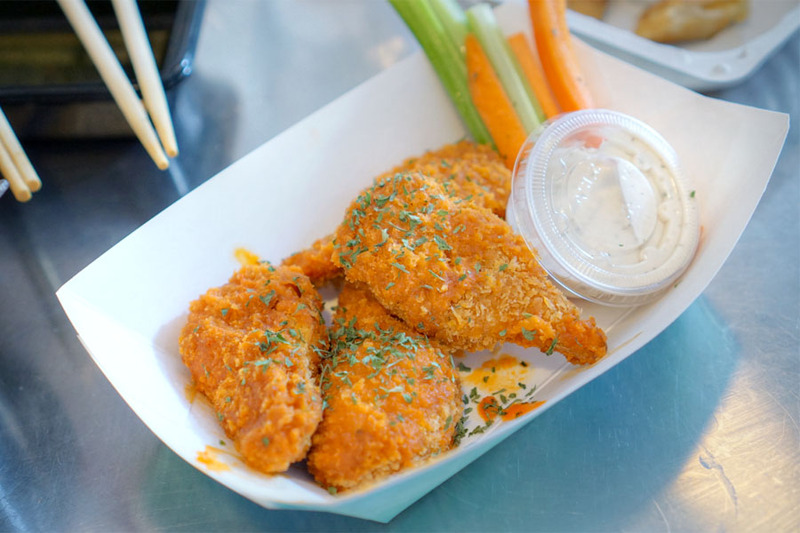 A vegan take on Buffalo wings was a surprise hit. I was a fan of the meatiness of the artichoke, as well as how its relatively mild taste complemented the tanginess of the Buffalo seasoning. Nice crunch from the crust, too. One of the better artichoke preps I've had in fact. 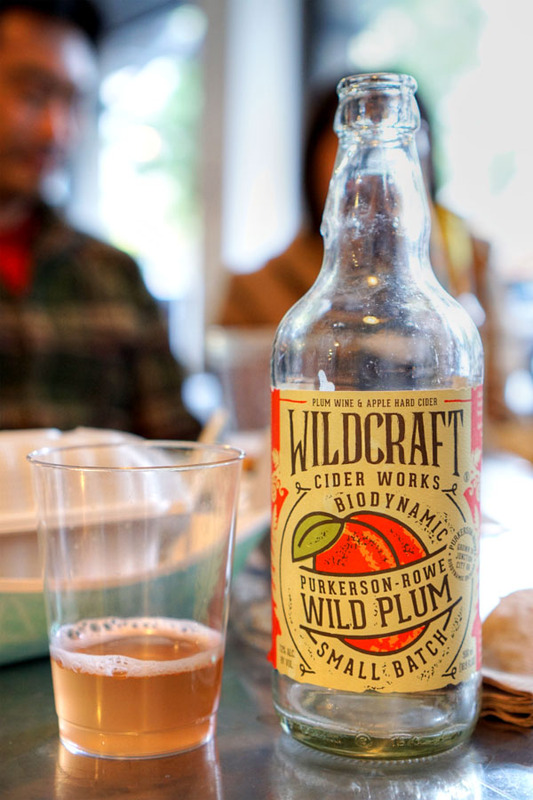 Finishing things off drink-wise was the 2016 WildCraft Purkerson-Rowe Wild Plum, an apple cider-plum wine hybrid. Nose here was straightforward, sweet apple. The taste was more interesting, with apple and funk at first, the sourness of plum coming in later and lingering. Golden Road was sort of a mixed bag. 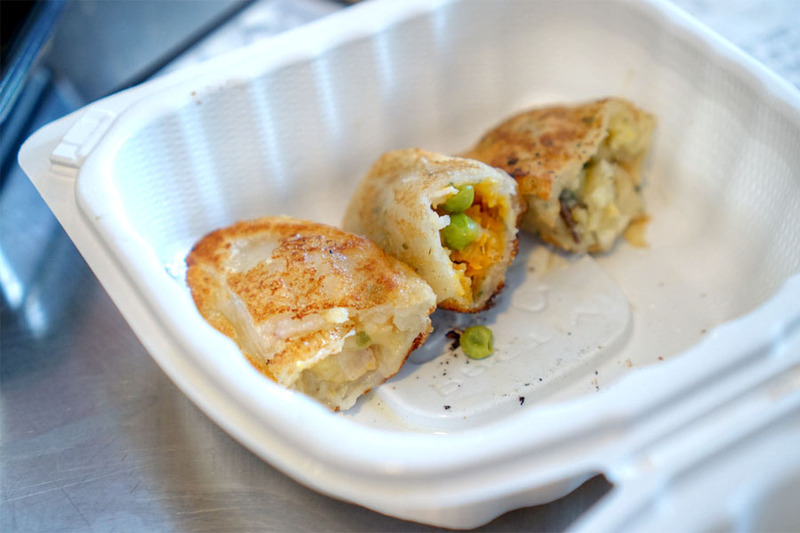 The two sides we had were actually quite good, and I do like the idea of a dumpling-focused menu, but the execution on those pierogies needs to be tightened up for sure. Hipster Kevin at it again. I knew the second I saw the dining location that Kevin wouldn't be able to resist bringing his own beer to a brewery run eatery. This is some serious snobbery. Kevin, could you please contact me at tony@tonys.la? I would like to talk to you about this review. Thank you. Given how lackluster Golden Road beers are, I can't fault the man for bringing his own. Pound for pound the worst craft brew in LA. Let us know how that conversation with Tony goes. Thanks bud! Anon: Wait, shouldn't I be drinking PBR (ironically) then? Steph: "brewery run eatery?" Have you even been to GCM? Tony: Are you still involved with Golden Road? I thought you'd stepped away from the business since the sale. My email's listed at the very top of the homepage if you'd like to reach me. Ralph: So I've heard. Though, I will say that I actually haven't had enough of their beers to make that claim myself. Anon: Yeah I'm sort of curious myself too.